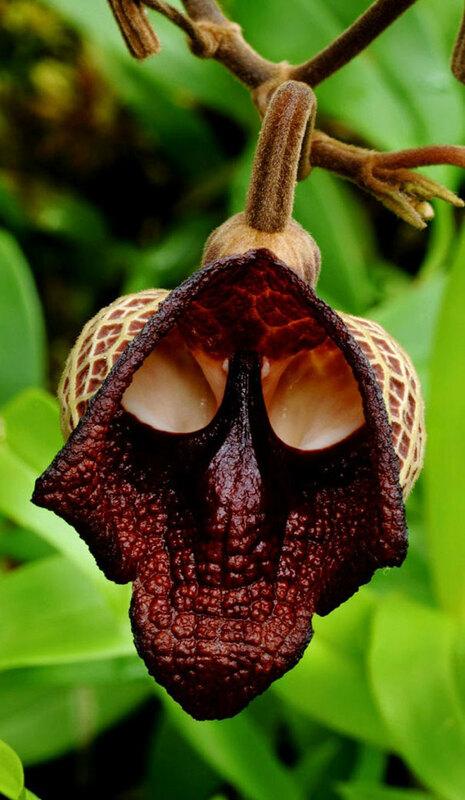 A skull orchid (Aristolochia salvadorensis) from Costa Rica. This is one of my all-time favorites, the Swaddled Baby orchid. Pretty unbelievable, but real. 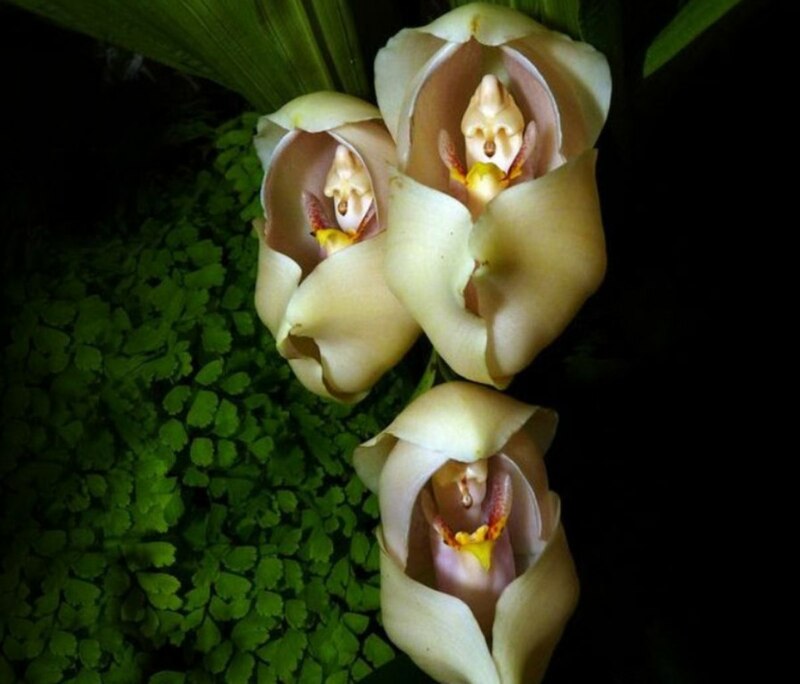 If you really want to grow swaddled baby orchids, but you don't live in South America, you are probably going to need a greenhouse, solarium or very warm conditions in your home in order to mimic the native growing conditions of these rare and unusual plants. They demand high humidity in order to produce large, healthy blooms, so if you can't provide that, your chances of being successful with these orchids is very slim. Orchids in this particular species (Anguloa) thrive in forest areas where there are distinct wet and dry seasons. 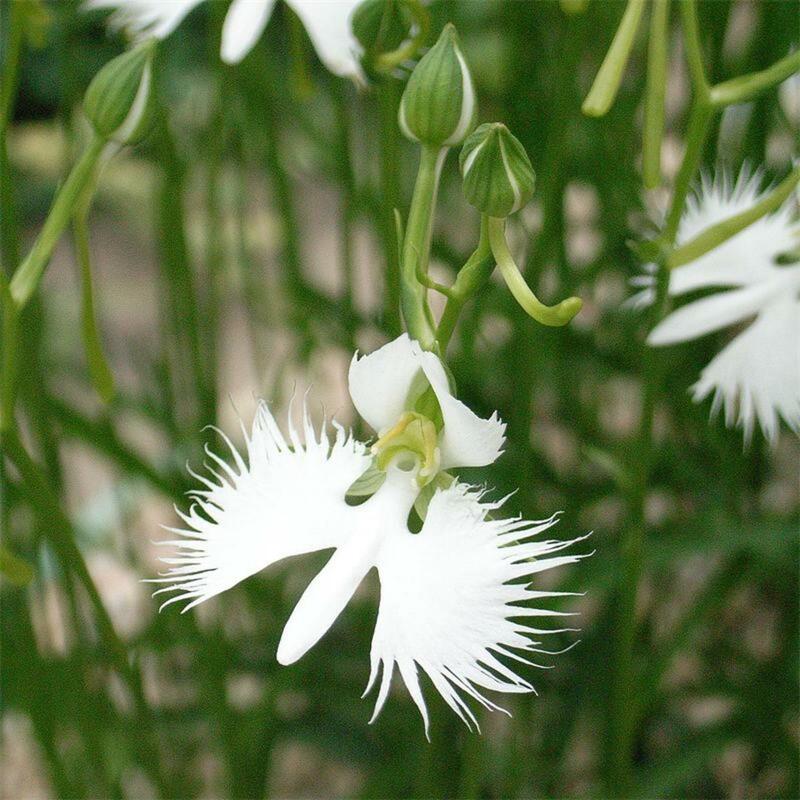 If you do master growing this precious flower, you will be rewarded with a very delicate, almost-spicy scent and blooms that last a long time, so good luck. Note: I am not going to go into great detail on many of these unusual plants because they may not be readily available and have limited growing areas. I have provided, however, photographs of each of them. 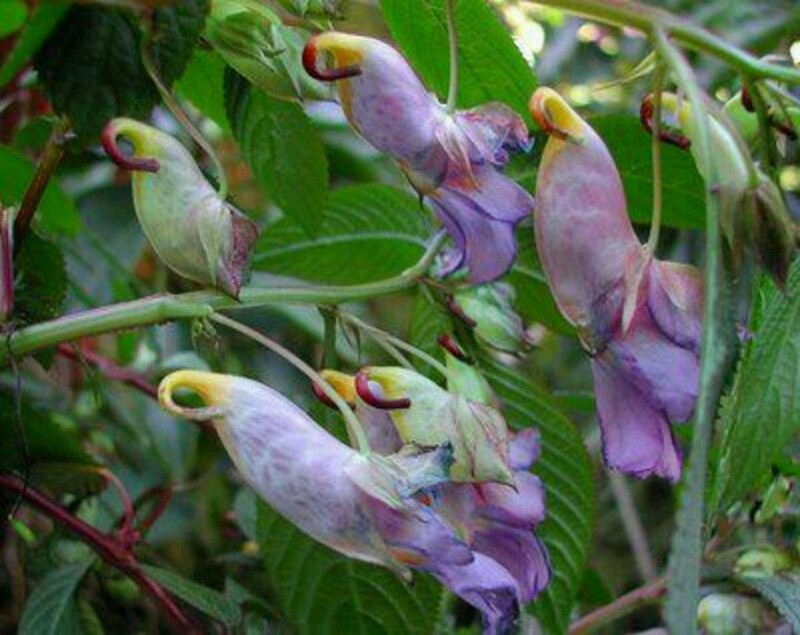 Parrot flowers, beautiful, but rarely found. 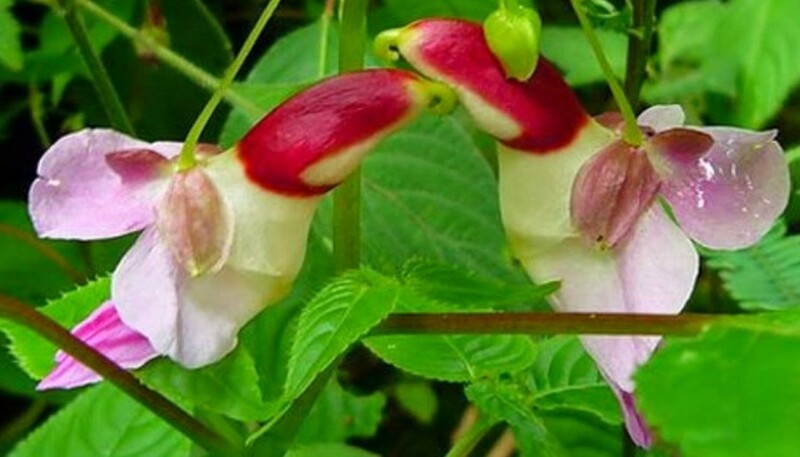 From the balsam family - although they are rare - comes the parrot flower (Impatiens psittacina), which bears a striking shape and color resembling an actual parrot in flight. A. H. Hildebrand was a British official who discovered the plant in Upper Burma and presented the seeds to the Royal Gardens at Kew in 1899. The seeds were germinated and brought to flower in 1900. And, yes, the flower is very real. It is an upright plant that branches profusely, but it only grows to a height of about five feet. The flowers are the only redeeming feature of this plant, which looks more like a very tall weed. 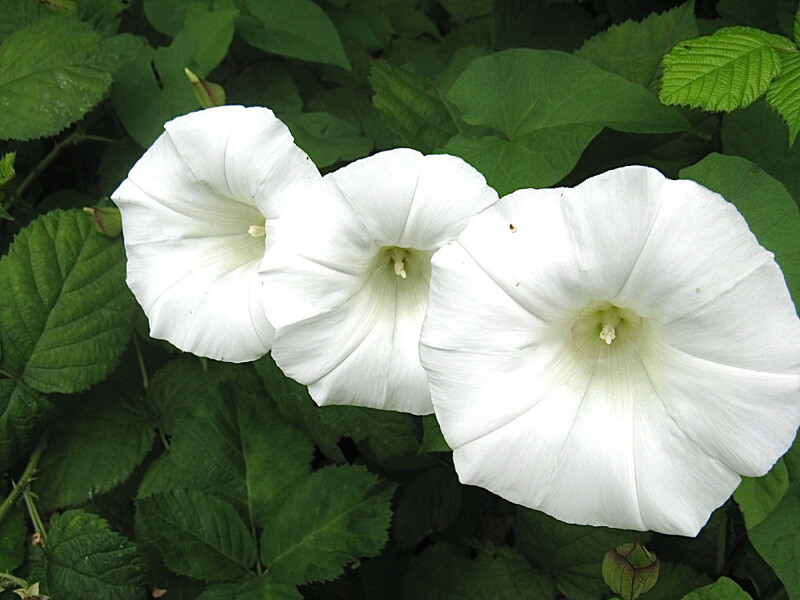 This plant is very difficult to grow because it requires a high soil pH and very high humidity. 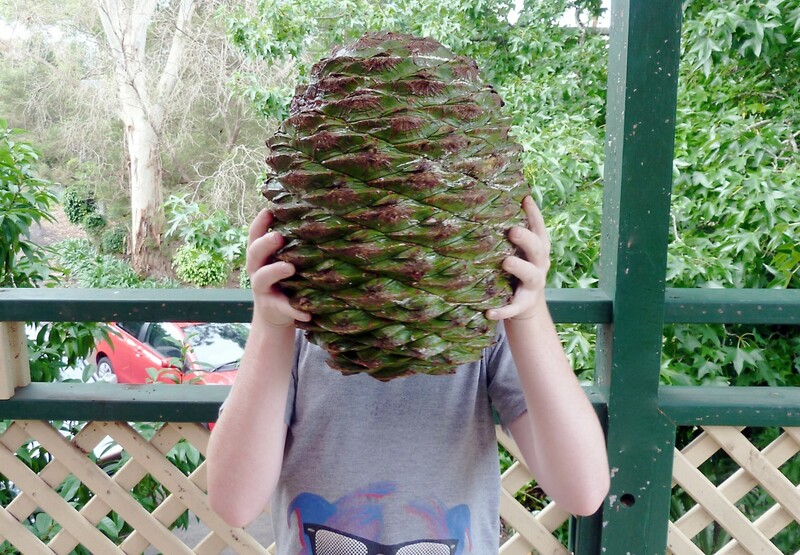 It is a protected species and neither the seeds nor the plant can be exported, much to the dismay of exotic plant collectors worldwide. The moth orchid is a very popular houseplant, and not as difficult to grow as many of the other flowers outlined within this article. 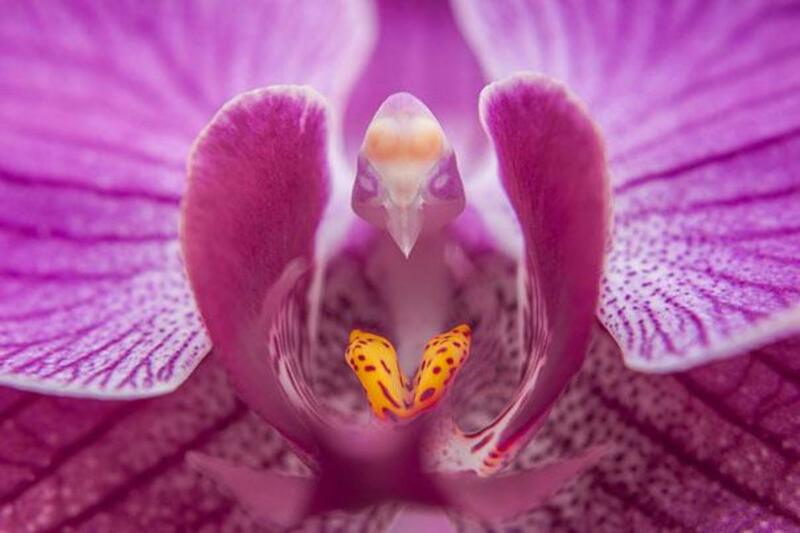 This close-up photograph of a moth orchid shows exactly how it got its name. Because the moth orchid (phalaenopsis) is one of the easier to grow in this group of strange-looking flowers, I am going to go into a little more detail about them. They are a houseplant that flowers all year round, but if you should need to re-pot, you can do so in the spring to early summer. They will grow from about six inches to almost three feet high and can have a spread of about 12 inches. 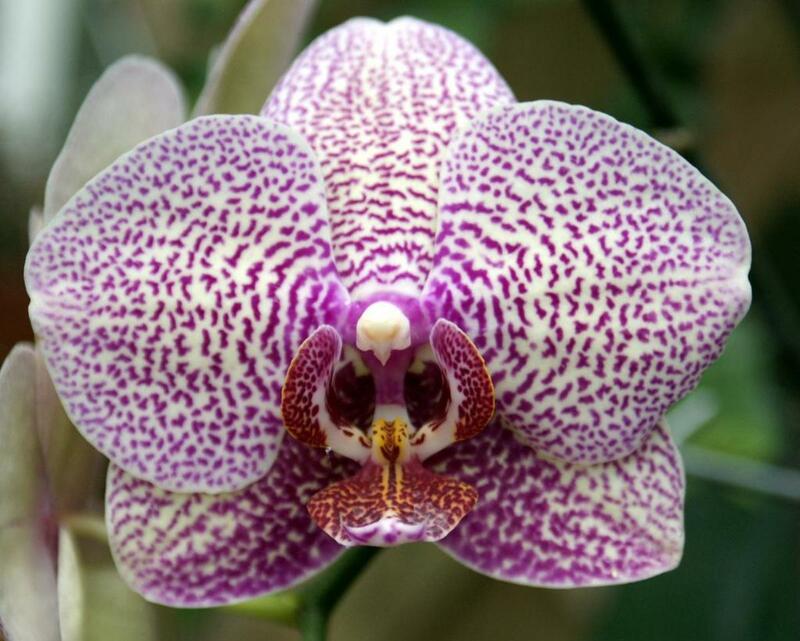 Before you do anything, you must first determine if your plant is, indeed, a moth orchid, because different types of orchids require different care. Moth orchids usually have three to six very broad floppy leaves, and the flower spike appears between those leaves. The flowers can look differently, and can be pink, yellow, white, or they can have stripes or a splotchy effect. 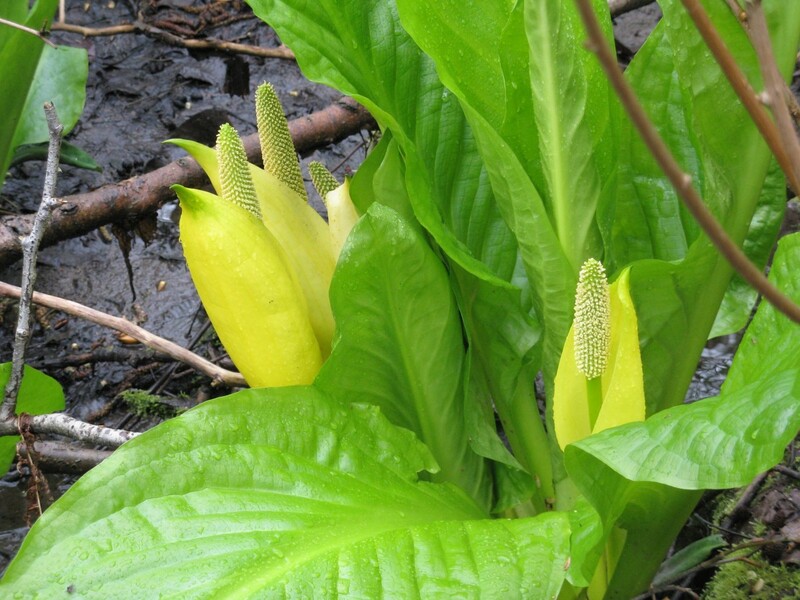 They are usually about two to four inches wide and they will bloom on a spike that could be from a foot to 18 inches long. It is possible that there will be more than one spike on a large plant, which could have up to 15 flowers (or even more). There are a lot of images on the internet that you could use for comparison. Once you are sure that your plant is a moth orchid, then you can safely follow the tips that I have presented here for you. To encourage flowering, your plant will need good light levels in the winter, making an east- or west-facing window a perfect location. In the summertime you will need to move it to a shadier spot, but away from direct sunlight. When the leaves get dusty, you should just wipe the dust off with a damp cloth (dust keeps the leaves from receiving a proper amount of light). Moth orchids will grow the best in a warm environment with temperatures in the 60s at night and from the high 60's to the mid-80's during the daytime. You should always place them in an area away from drafts. If you have a large, healthy plant but it is not producing flowers, you can reduce the temperature by 8-10 degrees for a month, which should result in the development of a flower spike. Your blooms should last about three months, but sometimes can last even longer; and they can bloom all through the year. When the flowers fade, cut the flowering stalk back (just above the second node, which should be visible beneath the spent blooms. Once you cut them back, it is possible that a new flowering side shoot could develop. Your plant will need to be watered regularly (about once a week) during the growing season, but during the winter, you can reduce the watering slightly. Always make sure you have proper drainage. The foliage needs to be kept dry, so when you are watering the plant, be careful not to get the water on the leaves, but in the summertime, you can lightly mist your plant. Over-watering will kill this gorgeous plant. Under-watering it is much less likely to have detrimental results. Feed your plant about once a month with a 10/10/10 or 20/20/20 plant food formula. Feeding can be done more often in the growing season. It is important to make sure that harmful accumulations of salts are leached from the compost, so about every fourth watering, use only plain water with no fertilizer. During the winter months, you only need to feed your plant very sparingly. Most orchids are grown in clear pots so that you can see what is happening with the roots in an effort to avoid root rot, which will kill the plant. Although this species is in rapid decline (mostly due to habitat destruction), it is a gorgeous example for the sake of this article. Today, it can be found in upland bogs and seepage slopes on high mountains in Japan - areas that are not suitable for agriculture. Coincidentally, there are many live egrets in Japan and they often share the same habitat with the flowers that bear their name. 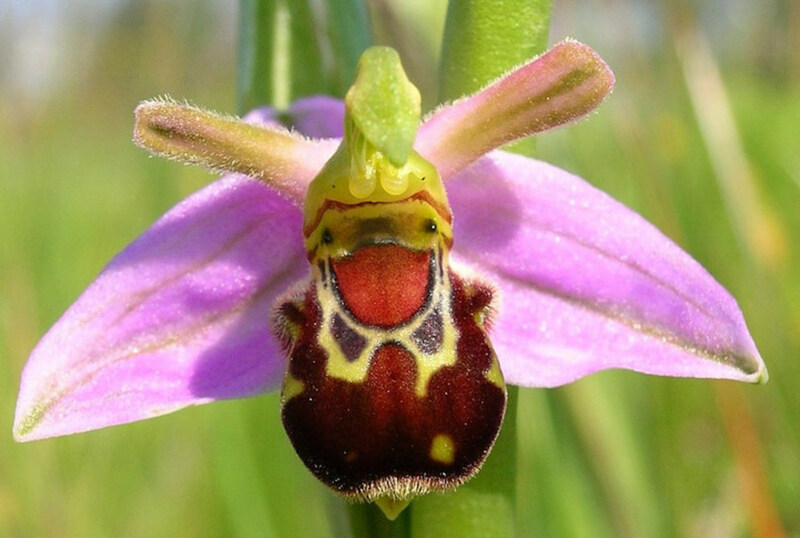 Yes, it looks just like a bee - this is a bee orchid. 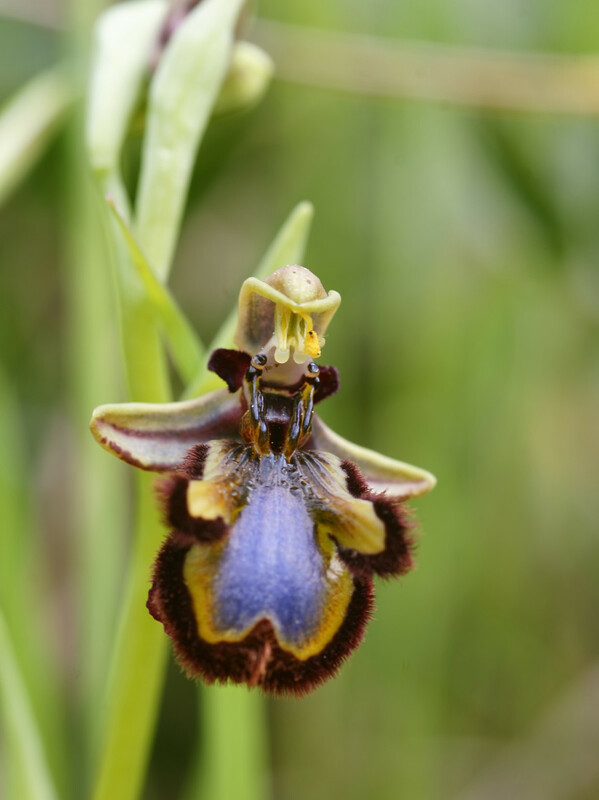 When you first see a bee orchid, you might swear that it is a live bee feeding on three flower petals, and real bees often visit these flowers hoping to mate with something that even they believe to be a bee. This serves as a way to pollinate the flower, as the bees transfer the pollen to female plants, but in reality the plant is pretty much self-pollinating. Real bees also love the sweet smell of this orchid, which, according to the Wildlife Trust's website "has a rosette of leaves at ground level and two leaves that grow up the stem as a sheath. The stem displays a number of relatively large flowers with pink sepals that look like wings and furry, brown lips that have yellow markings just like a bee." Although it is native to the United Kingdom, agriculture and urban development has threatened this orchid and it is protected in some vulnerable areas, such as Northern Ireland, where the Irish name is Magairlín na mbeach. If you live in the United States, you might get lucky and find a grower that specializes in orchids that could supply you with a plant, but they will grow best in a Mediterranean climate with moist, humus-rich soil, so always be aware that just because you want one, you might not be successful growing one if you are in the wrong climate. If you are lucky enough to find one, stay away from fertilizers and herbicides which can encourage grasses or other growth that might smother out the orchid. 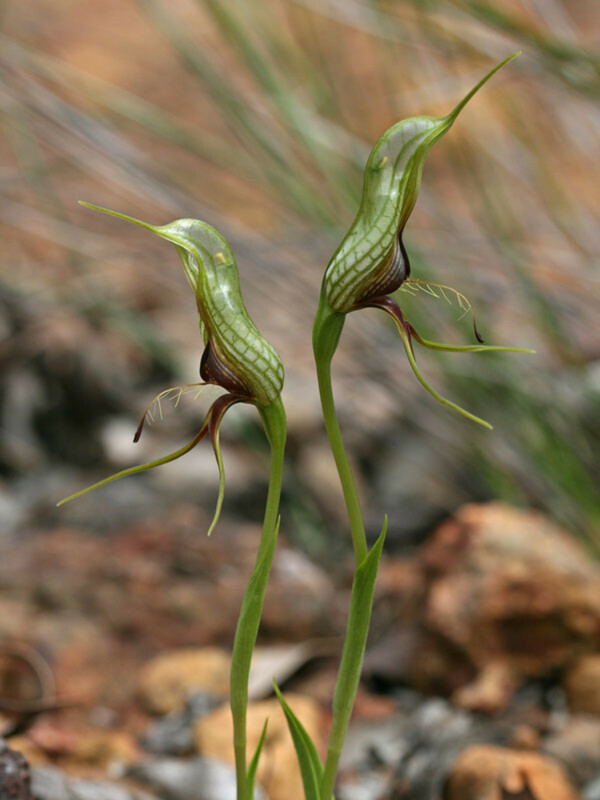 There are various species of bird orchids throughout most of the southwest part of Australia that are very similar in appearance, distinguished mainly by their size. 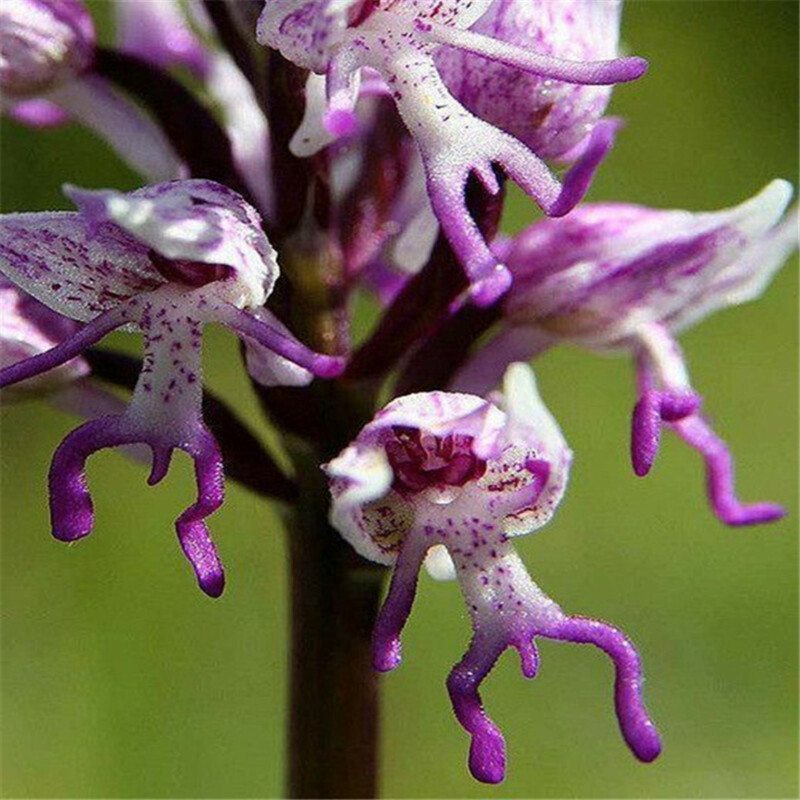 These flowers are called naked man orchids and they are native to the Mediterranean areas and regions like Jordan, Turkey, Italy, Portugal, Spain, Israel, Greece, but currently there are no sellers who are shipping them to the United States. 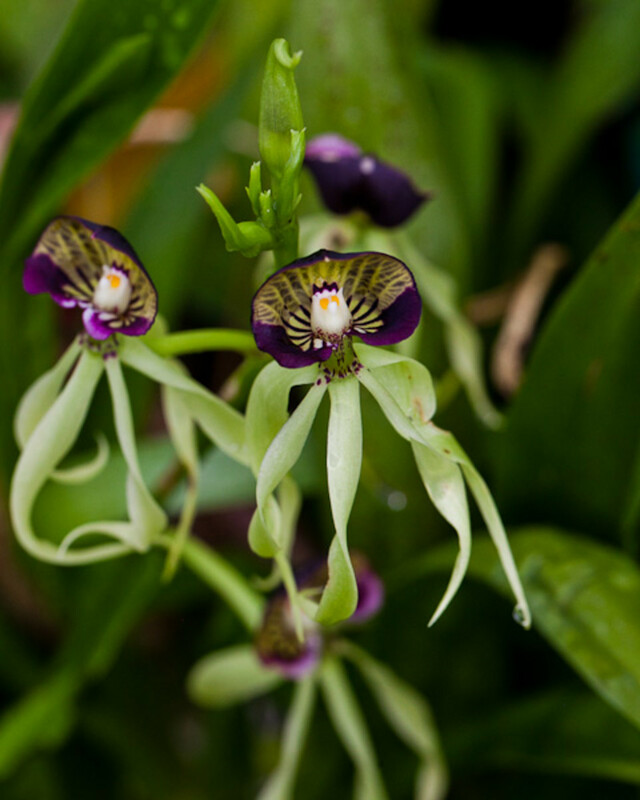 The green squid orchid, also referred to as Encyclia Cochlea, is native to Central America and the Caribbean. Flying duck orchids are appropriately named, as you can see. They are native to the Australian wilderness but are on Australia's vulnerable plant list, due mostly to habitat destruction. 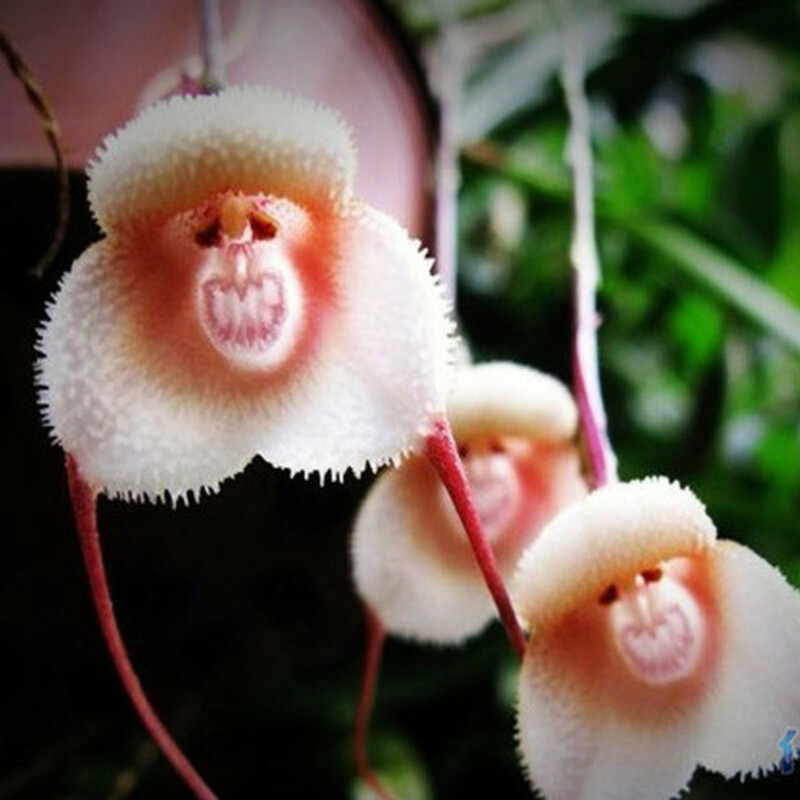 There are many varieties of monkey face orchids, and these photos represent a few of them. If you are interested in them, contact someone with your local orchid society. 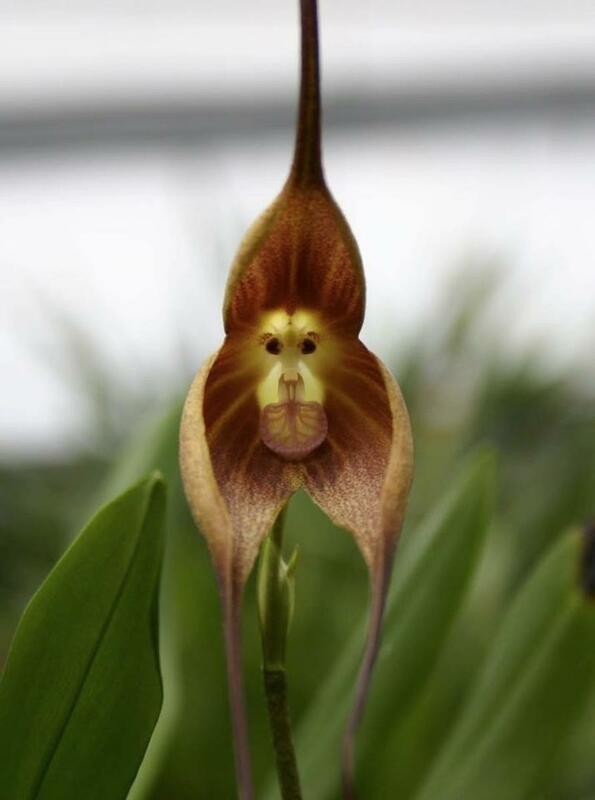 Another monkey face orchid. Apparently there are a lot of unscrupulous sellers on the internet who advertise seeds of this kind, but buyer beware. 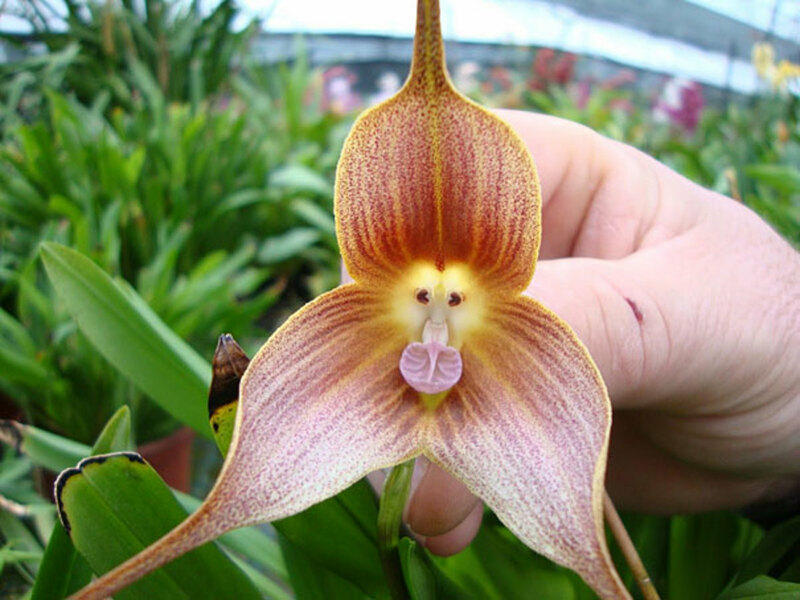 And yet another monkey face orchid. Contact a member of your local orchid society to find out where you can get legitimate monkey face orchid seeds. 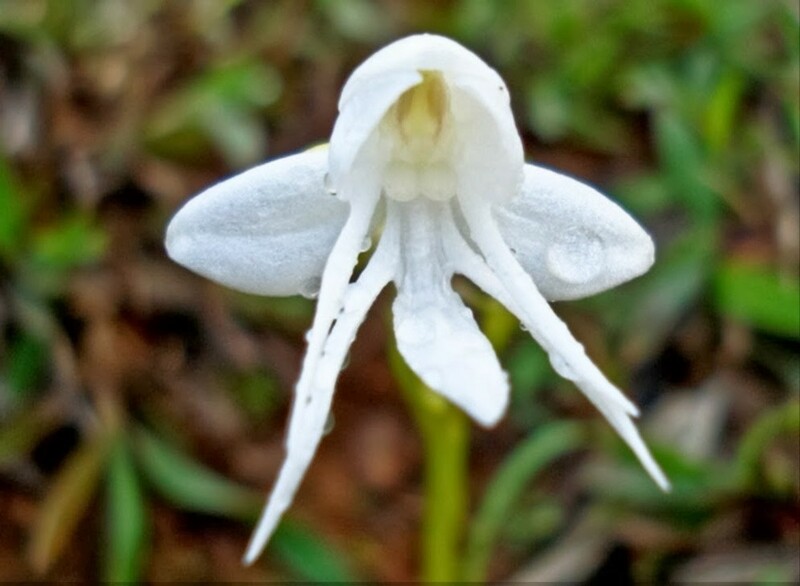 This beautiful angel orchid can be found growing in cool, moist areas of the eastern Himalayas and Vietnam. Common names include snow queen, coel cristata, coelogyne cristata and crested coelogyne. 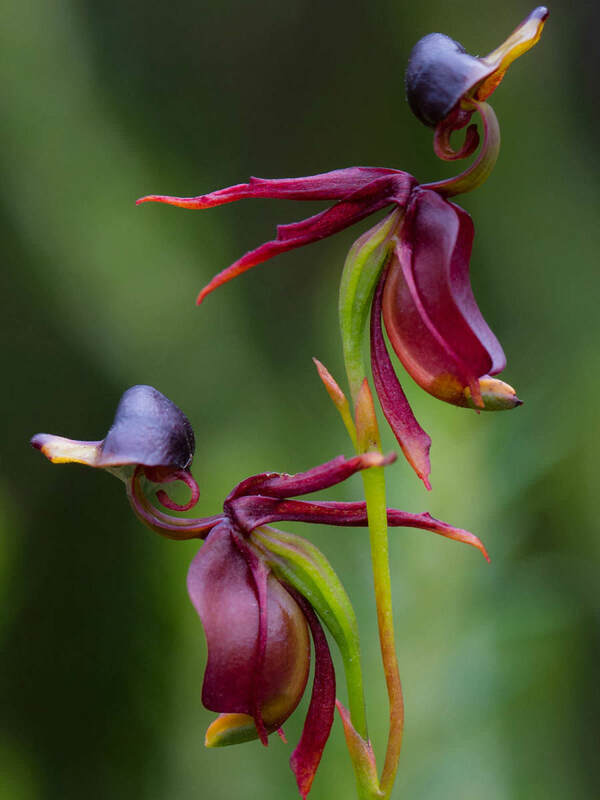 Unfortunately, these beautiful ballerina orchids are critically endangered and are only found in limited supply in Western Australia. Beautiful! Pictures where does Amaravalli come from? What an interesting article, also great pictures. I look forward to more. You can order most of them on E-bay or Amazon, although most of the time they are shipped from India or China and could take a while to receive. Thanks for reading. Where i can get plant or seeds of these plants? Thank you Pamela. I have learned so much since I've been writing for HubPages and I am glad you enjoyed it. You have so many fascinating pictures is this article. It is just amazing. I loved reading about this flowers and seeing these pictures. I truly enjoyed reading this article. Hi there! Thanks for stopping by anyway! I am always amazed at Mother Nature's talents. Thanks again. No, not weird. Part of nature doing what she needs to do to balance things out and make things happen. Again, loved those beautiful and amazing flowers. Thank you for your comments. I loved working on this article and even read somewhere that some of the flowers "evolved" into things (bees, for example) to attract other bees as a way of pollinating. Weird, right? I have never seen anything like this. I can't believe it. These flowers are absolutely beautiful and unique. 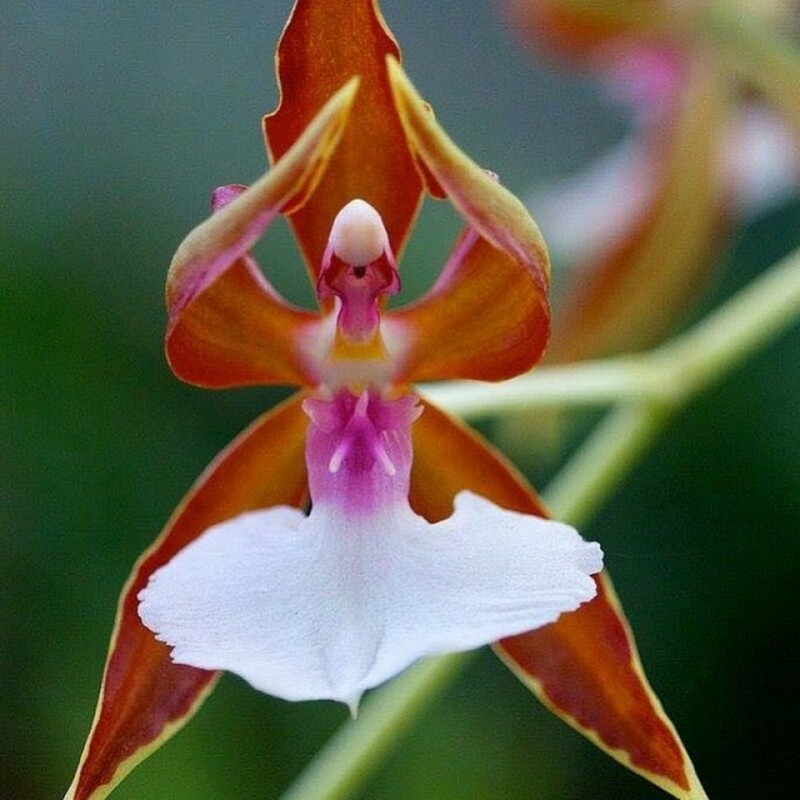 Why would mother nature create these flower animals and birds? 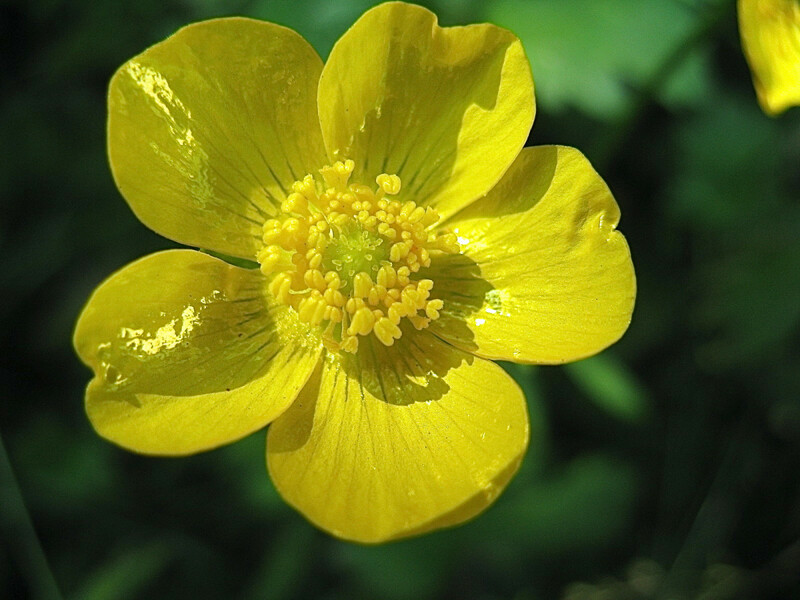 Do you think in some way these represented animal and bird shapes within the flower, means we really have to guard and protect them more so than any other animal or plant? Thank you so much for bringing these beautifully odd flowers into our lives.